Lead from recycled car batteries can be used to make perovskite solar cells. MIT researchers have the recipe. The past decade has seen such development in technologies, that I doubt anyone was able to predict it at the start. What is more, the world became more aware of climate change, and what we see now is an increasing trend towards sleek, efficient, clean, recyclable, and fair trade. The times when smoky factories, heavy metal mining and diesel burning vehicles were praised are over, opening up the paths to cleaner and more eco-friendly industries. Two fields advanced particularly fast in this period, and these are solar power generation and electric vehicles. As the time passed, technology progressed and became both much more desirable and affordable. This trend is still there for both solar and electric cars, with new improvements and discoveries emerging every day. In the field of solar, the experts found the perovskite material, promising thinner, more efficient, and flexible solar cells, which can be installed on windows and facades. The only problem is that provoskite is made of lead, and if the demand is to increase, more mining and smelting would be needed, defeating the green purpose. In the field of electric vehicles, on the other hand, engineers are focusing more and more on replacing the batteries with lead-free alternatives. But while this is happening, all the currently used lead-acid batteries would have to be disposed of. So, a team of MIT researchers decided to look for ways in which they can address both of the above issues. They came up with a technology, which allows them to extract lead from old batteries and use it to make perovskite material. The team states that perovskite solar cells made from recycled lead perform just as well as the ones made of high-purity brand new lead. The development is highly promising, and if made commercial, it could bring enormous benefits to the environment. Just to put it all in numbers, one lead-acid battery could power 30 households in Nevada, as it can be turned into 700 square meters of perovskite solar cells. 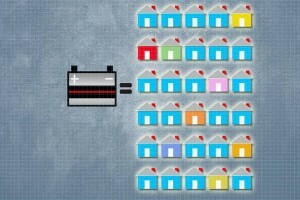 To power the whole of the US, the MIT researchers believe that they would need 12.2 million recycled car batteries. This should make roughly 8,634 square kilometers of perovskite solar cells (operating under Nevada weather conditions, at 15% efficiency). Incredible new technology, which is highly likely to become real (hopefully, soon). All technical details can be found in the journal Energy&Environmental Science.